Ava is the captain's daughter. This allows her limited freedom and a certain status in the Parastrata's rigid society--but it doesn't mean she can read or write or even withstand the forces of gravity. When Ava learns she is to be traded in marriage to another merchant ship, she hopes for the best. After all, she is the captain's daughter. But instead, betrayal, banishment, and a brush with love and death are her destiny, and Ava stows away on a mail sloop bound for Earth in order to escape both her past and her future. The gravity almost kills her. 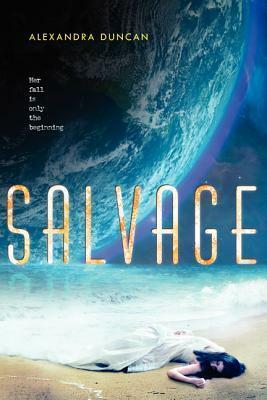 Gradually recuperating in a stranger's floating cabin on the Gyre, a huge mass of scrap and garbage in the Pacific Ocean, Ava begins to learn the true meaning of family and home and trust--and she begins to nourish her own strength and soul. This sweeping and harrowing novel explores themes of choice, agency, rebellion, and family, and after a tidal wave destroys the Gyre and all those who live there, ultimately sends its main character on a thrilling journey to Mumbai, the beating heart of Alexandra Duncan's post-climate change Earth. An Andre Norton Award nominee. But she is Parastrata Ava, the Captain's eldest daughter, the so girl of a long-range crewe--her obligations are grave and many.